Join us as we go behind the scenes at Tufts University to learn how to make a mini documentary with Multimedia Producer Steffan Hacker. Steffan has traveled the world, camera in hand, with Habitat for Humanity International as a photographer and multimedia producer. He currently produces educational videos and films for Tufts University, located in the Boston area of the United States. Steffan is a former colleague and has earned my respect as one of the hardest working and most talented multimedia producers in the industry. [Question] We recently watched your mini-documentary "Fight or Flee" that you produced for Tufts University. First, great job. What can you tell us about this assignment and how you decided on your approach? [Steffan Hacker] Thanks very much, glad you liked it. The idea for this came pretty early in my time at Tufts. Science and research are very important to the university so I decided to look for a specific researcher to profile. One of the things that struck me right away was that a lot of the scientific work was really fascinating but couldn’t be easily documented with video. This is very different from my time at Habitat for Humanity. At Habitat, I worked with a lot of tangible subject matter--construction and houses being the most obvious things. Now at Tufts, I have the challenge of covering scientific work which is often concerned with things that can be really small, really big or altogether theoretical. And I’ve come to enjoy doing these kinds of stories despite the fact that there isn’t always something obvious to shoot. It’s forced me to be more creative, less literal. In the case of the “Fight or Flee” piece, Dr. Jamie Maguire, the subject of the video, made a couple things really easy. First off, she was great to work with and incredibly accommodating so I had no trouble making arrangements and spending time in her lab. The neurological scans she shared with me were great because it made the specific parts of the brain that she was talking about seem much more real and accessible to someone that isn’t a neuroscientist. I used Adobe After Effects and Photoshop to add a little interest. I separated the false colors into layers and added simple animation to give the images some depth and movement. The last component I needed was a visual way to represent the stresses of modern life, something that Dr. Maguire also spoke about. At first, I thought about things like graphics or stock examples of specific stressors in a typical workplace. Then it occurred to me that a better, not to mention simpler, option was literally right outside the door. The Boston campus of Tufts is in the heart of Chinatown. It’s a busy area with a lot of people hurrying by. So I spent a rainy evening filming people and cars during rush hour. The shiny streets and city lights made for some rich colors. I liked the way this contrasted with the monochrome setting of the lab in the final piece. It was a good reminder to always look for ideas in my immediate surroundings. 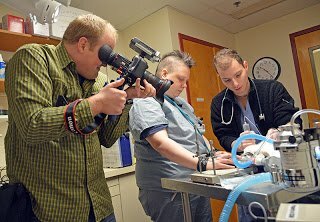 Photo Caption: Multimedia producer Steffan Hacker shooting a veterinary procedure for the video "An Uncommon Bond" (video posted above). Gear in hand: Canon 5D Mark II with the Zoom H4N recorder mounted on the hot shoe. 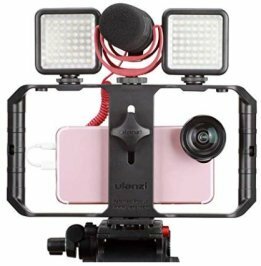 "The room was very small so I used the Zoom's built in mics, this works perfectly fine in confined spaces," says Steffan. The eye piece is the Zacuto Z-Finder Pro 2.5x and the mount is the Redrock nano RunningMan. [Question] I noticed there was no flicker in the computer screens in the "Fight or Flee" video. How did you accomplish that? [Steffan Hacker] I actually had some trouble correcting that and I’d say there’s still some degree of flicker. 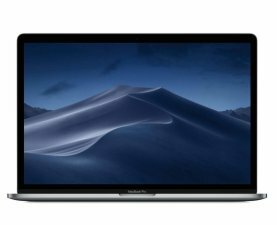 But, I’m happy you asked that because it would seem that using the deflicker and rolling shutter correction features of Adobe Premiere Pro were good remedies. Since that shoot, I’ve learned more about how to prevent, or at least minimize, monitor flicker from the get-go by adjusting the frame rate and shutter speed. It’s still trial and error since the specs of monitors can vary so much. I don’t subscribe to a single magic formula. Oftentimes I simply do my best to minimize a distracting flaw when I can’t correct it 100%. 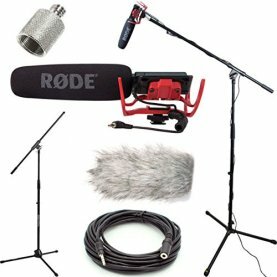 [Question] What kind of video production gear do you use (mics, camera, etc)? [Steffan Hacker] I recently started shooting with a Canon C100, which has been great so far. Up until now, the bulk of my shooting was done with the combo of a Canon 5D Mark II and a Canon 24-105mm f/4L lens. For interviews I used a Tram TR-50 lavaliere, recording to a Zoom H4n. The Rode VideoMic plugged straight into the camera input worked fine for most of my b-roll. When I really needed good nat sound, I recorded a separate track with the Rode NTG-2 shotgun mic and the Zoom. The tripod I use is a Manfrotto 504HD. [Question] Do you use existing lighting or a lighting kit? [Steffan Hacker] I try to get as far as I can with existing light. Then, depending on the situation, I’ll use a basic lighting kit to fill-in or accent. For the “Fight or Flee” project, I used a 1x1’ LED panel (FloLight MicroBeam 1024 LED) for the interview. I had it dialed way down since we were in a small office and I couldn’t place it at an optimal distance. Luckily there was also a window letting in some natural light. For some of the lab shots, however, there was very little available light and the room was even smaller and darker. 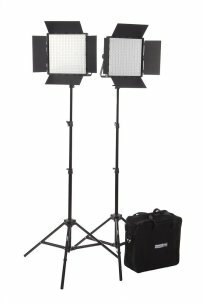 Out of necessity, I had to use a couple 4x6” LED panels (Lite Panels Croma Camera Mounted LED Light) as the primary light sources for tight spaces. For the rest, I just opened up to f/1.4 on my 50mm without adding any light which turned out surprisingly well, considering how dark it was. [Question] Do you work mostly as a one-man-production-crew or do you have a crew? [Question] You started out as a photographer and transitioned into filmmaking. Was that by choice or just the nature of how technology is changing? [Steffan Hacker] The short answer is “both.” Initially, I thought of it as professional self-preservation. But it didn’t take me long to get excited about all the possibilities. Being a photographer brought me many significant, even life-changing experiences. No matter the assignment, I always felt my main duty was to bring something of value and meaning to an audience. As I got into audio and video, it’s almost like it awakened more of my senses. I learned to see and hear more of the world around me. I was suddenly able to bring even more value to the audience. There are many great still portraits that tell us so much about people. But sometimes when you can see them move and hear their voices, they become much more real and relatable. Photography, videography, audio and multimedia often require different approaches and skills. Certain subjects and stories are better communicated through one medium or the other. The thing that ties it all together is being able to say to other people “I want you to know about this. Please take a moment and have a look.” That’s what still matters to me the most as the tools and techniques of my work continue to change and evolve. [Question] And finally, what is your biggest advice for a newcomer thinking about a career in photography/films/documentaries? [Steffan Hacker] Embrace seemingly boring assignments and the challenge of making them not-so-boring. First you’ll become technically proficient. It takes a lot of skill to consistently get quality imagery from places with terrible lighting and not much action happening. And you’ll eventually learn to harness that skill in creative ways. If you gain the ability to bring something special to your coverage of subjects that aren’t especially interesting, then you’ll be on your way to establishing your own visual style. And when you are lucky enough to get a “plum assignment”, whatever that means to you, you’ll really be able to make the most of the opportunity. That, of course, can lead to more work. Steffan Hacker is a multimedia producer, videographer and photographer whose 15 years of experience working with f-stops and shutter speeds has taken him to over 30 countries, 100 U.S. cities and more hotel conference rooms than he can remember. He is currently a Multimedia Producer at Tufts University in Massachusetts. 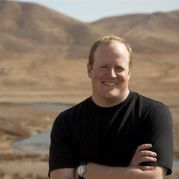 He spent the previous ten years as staff photographer and multimedia producer for Habitat for Humanity International based in Georgia. You can learn more about Steffan at www.steffanhacker.com or follow him on Twitter at @steffanhacker. What Is A Mini-Documentary and How Do You Make One?